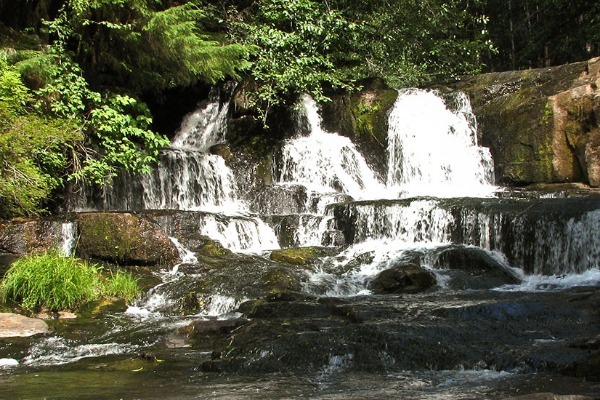 The Alsea Falls Recreation Site is located in Oregon's beautiful Coast Range, about 45 minutes south of Corvallis. There's no shortage of fun and adventure to be found at Alsea Falls. Looking to get some hiking or biking done? Maybe you're after a swimming hole or want to do some fishing? Or maybe you just want a beautiful spot to bring the family for a bit of camping or a nice afternoon picnic. Whatever you're in the mood for, you can probably find it at Alsea Falls. There's a small day-use fee of $5. There's also a variety of campsites, including single and group campsites. Amenities in the campground include drinking water and vault toilets, and several of the campsites can handle large RVs or trailers (up to 32 feet long). Camping fees range from $12 to $20.